It all started in Norfolk, Virginia in 2013, when I first began to take photographs professionally. Jabril and I were sitting in Computational Methods in Mechanical Engineering (one of the hardest classes I had to fight my way through in college) and he was telling me about his new lady friend. She had a birthday approaching and wanted to surprise her with a birthday photo session of them two. Although it was a chilly and misty day we managed to surprise her and the session went exceptionally well. Well, four years later and I'm photographing their engagement session! 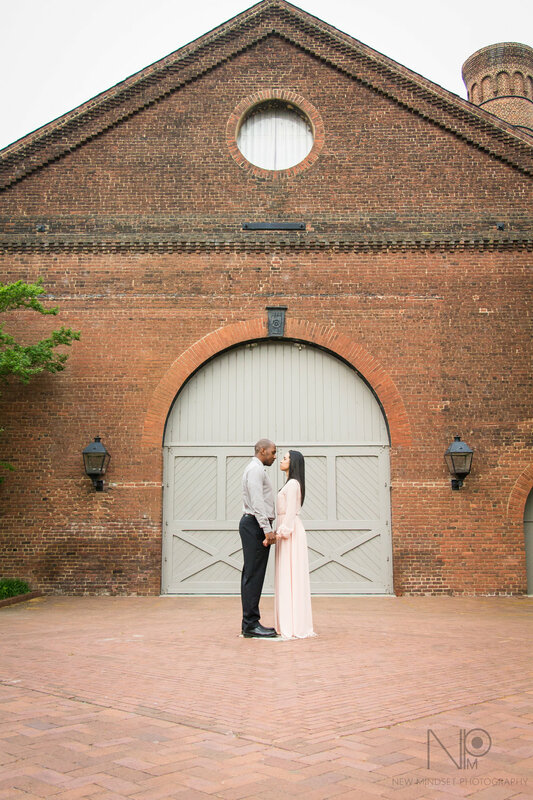 Olivia chose a great location in Tredegar Iron Works located in Richmond, Virginia that complimented their color coordination and the elegant sophisticated theme she was looking for. In addition to taking a few photos at Tredegar, we took their casual-clothed photos at Brown's Island taking advantage of Richmond city's high-rise structures and serene canal. Next year we will be photographing their "Cinco de Mayo" wedding and we are excited to share their photos from the wedding!